My little corner where I knit, spin, craft and do much more! I'm addicted to socks and scarfs. I'm still learning but interested in all kinds of stuff! So, finally the promissed pictures. A bit later, as always, but I had a rough week and the weekend wasn't any better. I don't know how the coming week will be, but I'm not really looking forward to it at all. First of all, I've been ordering quite a few things online, and the first package arrived today. It's from "Die St(r)icknadel", a German based shop that sells Addi turbos at a decent rate. 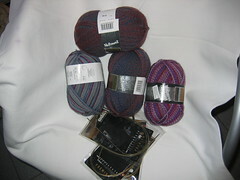 I of course had to order some extra, and that's the Meilenweit sock yarn you see in the picture! The 2 balls of Mega Boots Stretch are for some knee high socks! 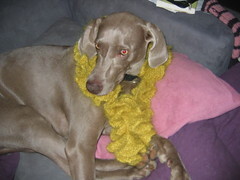 And here is my doggy showing the Ruffle Scarf (don't know is that's the name) from the book Handknit Holidays . I'm seriously happy it's done. I hate the yarn (mostly the colour) and it was just to much stockinette. Don't get me wrong, I'll probably do more of these scarfs for Christmas, but then I won't rush them so much, 'cause it's really, really boring! Don't get me wrong, these colours are gorgious and I'm sure I'll use the white for a sweater in the future, but I just didn't want my vest black/white 'cause I wouldn't wear it and I want to be able to wear this vest! I used Dylon dyes and mixed purple with a bit of Cherry Red. Could have done with a bit less Cherry red, but it's still and nice colour which I love. It's especially nice in combination with the black (well, more grey, but still). I swatched, but the swatch was to small to take a decent picture off. Now I got a bit of a scare when my gauge didn't rutn out the way I wanted it, but after thinking it over I found out I was just stretching my swatch to much after the wash, and after another wash I got perfect guage. So I started the ribbing, and after 4 rows I noticed I had twisted the ribbing! That never happened to me before, but hey, there's a first for everything, right? So I ripped and started over. I'm now about 10 rows into the basic ribbing, hopefully more in the near future! My first Norwegian Stocking! 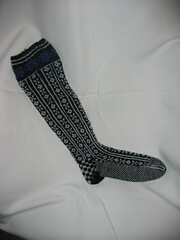 After fiddling with the needles I ended up with 3mm and the sock fits so well! It's nice and tight, which I like! I knitted it in an awful short time, lets hope the second one will go just as fast. 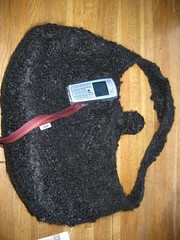 But I had a lot of other knitting to do (like casting off the ruffle scarf, which took me 3 hours! Well, I had to cast off 1600 stitches). Hopefully by the end of the week I'll have a pair, that is, if I don't get to obsessed with my vest! 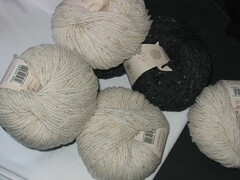 Last, if you made it to the end of this post, I just posted some yarns at DeStash which is started to get rid of your stash. 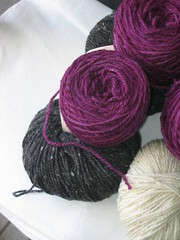 I'm not to hopefull, as usually not many people are interested in the yarns I offer, but feel free to check it out! The yarns are really good quality (I'm a yarn snob, so that's not really a surprise) but I guess it's the shipping that does it! Ofcourse I am interested! I never say NO to yarn! 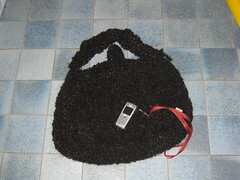 Thank you very much, specially cause have to knit some cover for our cottage house - acrilyc is quite perfect for that! P.S. I am reading your blog, and you are on my left sidebar under Rebecca! Oh I Love the color you dyed for the Argyle vest! Can't wait to see it. Congrats on finishing the Norwegian stocking- it looks great! Hope your week is better than last! Gorgeous stocking! The more I see these on the web, the more I want to make them again. This is a Flickr badge showing public photos from Elatha Tuila. Make your own badge here. "To do"-list finally getting shorter! Why computers sometimes frustrate me! Contest Winner & FO & Handdyed yarn! !